Campeggio de Courtille si trova a Guéret, Creuse, è situato a un lago. Questo campeggio dispone di piazzole delimitate, sia ombreggiate che, senza ombra e piazzole poco ombreggiate. Camping de Courtille si trova nei pressi di una spiaggia di sabbia. È possibile affittare casemobili. Per gli sportivi, il campeggio prevede diversi percorsi in bicicletta. Nelle immediate vicinanze potete fare il bagno nel lago. Al campeggio Camping de Courtille è possibile praticare windsurf. Ogni anno un ispettore visita il Campeggio de Courtille, controllando oltre 200 tra attrezzature e altri punti di interesse del campeggio. L'ispettore è un dipendente ACSI e non lavora per il campeggio. Very quiet off season, 6 units on site. Toilet facilities also have the recycling point - very practical. Pitches in circles of 8 making it feel a small site. Lake within walking distance. Super location and ideal for dog walking. Nicely laid out camp site and quiet, but pitches are often on a slope and get waterlogged in a lot of rain. If the weather is less than hot, the shoers are a nightmare because there are no closing doors to the outside. So, once wet, the wind blows onto your wet hair and body and it is not a pleasant experience. Closing doors would make SUCH a difference. We have stayed here in April and September and found the same problem both times. We will be back, but not to have a shower!! This site was a disappointment. The lake beside it was lovely with pleasant walking around it, it was on the edge of the town of Gueret but perhaps just beyond walking distance. Entrance to the site is barrier controlled and when we arrived the reception was unmanned and a phone number given to make a contact. When the male owner arrived he was abrupt and seemed to be in a hurry to be else where, several other campers also complained about this. The site itself is divided into 5 circular compounds with approx. 5 pitches in each compound. Two of the compounds were closed even though the site was full most of the 4 nights we were there but my main complaint is that the pitches were small, sloping and required a good deal of levelling, most of the users were one nighters so we were able to get one of the better pitches. Toilet/shower/dish washing facilities were good but I would not use his site again. Staff very helpful. Located by a lake with lovely walk round. Pitches fine, but some on a bit of a slope. Toilets clean enough, but like others have said one Turkish which we don't like. Showers very nice, but washing up water a tad cool. Drive in along a fairly narrow road. Good stopover rather than long term stay. Stayed here one night. This is a barrier controlled site so cannot get in if no one in reception. Staff were very friendly and helpful. Beautiful surroundings by lake. Pitches were well laid out in circular design. Toilet block was clean and well maintained, but lack of standard toilets. Lovely walk around the lake. Big supermarket in town, although not in walking distance. Bread could be ordered at reception for following day and small shop on site. We would definitely recommend this site. When we arrived the site was deserted, no staff, no vans but there was a sign on the door saying office would be open after 18.00. We waited, other vans came and went. When the staff arrived we booked in and were directed to a pitch (most were un-useable due to rain!). We were the only van on site. It is a beautiful location and we thoroughly enjoyed it. We had stocked up at Leclerc in Gueret (be aware of height barriers on all car parks, we parked by bins at back of shop). The bird life is fantastic and the walk around the lake is a must. The shower and toilet was simple but spacious and clean, if rather cold. The washing up facilities are good and there are plenty of play areas for the young and for the older keep fit! Overall we loved it here due to the beauty and the environment. We stayed on this beautiful campsite for 3 nights, the staff are so friendly, the pitches are spacious. The site though busy was tranquil. The toilets and showers are a bit dated but very clean. Our 2 dogs loved the nearby lake as much as we did. It is a bit too far to walk to the supermarket, but we will make sure we stock up in future, because we will most certainly be going back! The new owners continue to be improving the things. Stayed here twice recently and continue to find the place very good. Will no doubt be going again later this year with perhaps more time to stay. Volete prenotare il Campeggio de Courtille o oppure saperne di più? Potete farlo usando i seguenti dati. Dalla A20 uscita 23 direz. Guéret (N145). Poi uscita 48 e 49 e seguire i cartelli. Bene il navigatore, ma rinvia a strade molto strette. Meglio seguire la direzione tramite la segnaletica. 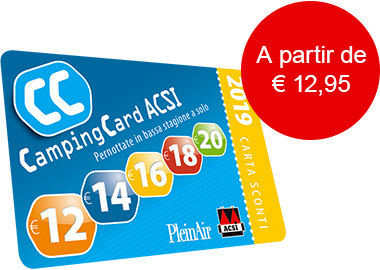 ACSI Eurocampings invia la tua richiesta di informazioni al "Campeggio de Courtille".